Murray Polner, a regular HNN book reviewer, wrote “No Victory Parades: The Return of the Vietnam Veteran” and “When Can We Come Home? A Debate on Amnesty for Exiles, Anti-War Prisoners and Others.” He served in the U.S. Army. In 1932, a former army office living in Oregon was so infuriated by the failure of the federal government to award WWI vets their promised bonuses that he managed to inspire several hundred of them to join him and undertake a march on Washington. They traveled in autos, trucks and box cars only to be denounced by their government as communists. (Their trek and arrival was vividly described in Paul Dickson and Thomas B. Allen’s 2005 book “The Bonus Army: An American Epic.”) The vets ultimately received their bonuses in 1936 but before then American soldiers led by the imperious General Douglas MacArthur acting under the orders of President Herbert Hoover assaulted the vets in sight of the nation’s capital. It was a shameful but memorable event and remained very much in the minds of later politicians forced to grapple with the needs of those who later served in war and peace. 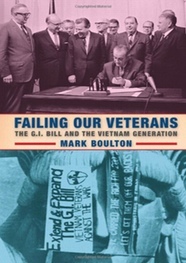 Mark Boulton’s book “Failing Our Veterans” is a comprehensive and compelling legislative history which skillfully details how ideology, economic and personal and political biases have shaped the way vets have been dealt with from the Revolutionary era to Vietnam. Disabled Revolutionary War vets, for example, were granted half-pay for life though some politicians opposed the grant on the grounds of expense. War of 1812 and Mexican War vets received land grants and wounded vets some compensation. But the process was tortuously slow. The 1812 group received their reward in 1871 – long after many of them had died—while Mexican War vets finally received their grants in 1887, decades after most of General Winfield Scott’s men had passed from the scene. The Civil War’s Union soldiers did much better because of the political pull of the newly-organized Grand Army of the Republic, much as the American Legion and the Veterans of Foreign Wars had developed and pushed the landmark G.I. Bill of 1944 for WWII vets, certainly one of the most momentous pieces of legislation ever enacted. Vets received the famous 52-20 payments to help them adjust to civilian life together with munificent educational and housing benefits. The resulting impact on society was huge. “These provisions helped forestall a widely feared economic depression, expanded the home-owning middle class and helped democratize higher education,” writes Boulton, Assistant Professor of History at Westminster College. In 1952, Korean War vets were granted roughly similar benefits. While some thought the law was overly generous, most Americans did not, believing that the years spent in uniform, fighting or behind the lines, were worth the rewards. Not every president agreed. Thomas Jefferson believed that rewarding veterans might damage their moral fiber. Dwight Eisenhower questioned why men and women who served in peacetime should receive federal benefits. He named his army friend General Omar Bradley to lead a study commission. It concluded that serving in the military was “an obligation of citizenship, not a basis for government benefits.” In other words, Ike and Omar, having benefitted from their military careers as West Point students (free education) and active duty (Ike, for example, never experienced combat) were against 1944-type benefits to anyone who ever wore a uniform, willingly or unwillingly. And before he signed the G.I. Bill, FDR, who of course never served, wanted to add a “means test” but was dissuaded by the American Legion and the VFW. During the Vietnam War that he initiated, Lyndon Johnson worried more about the poor and dispossessed than he did veterans. And some in Congress, stung by negative articles in the media about alleged widespread use of drugs in Vietnam, and appalled at the sight of protesting veterans publicly discarding their medals in Washington, were reluctant to offer them a 1944-like Vietnam G.I. Bill. Besides, the American public had finally turned against the war and a “lost” war at that. Richard Nixon, who inherited and extended LBJ’s war, had an “erratic” record toward Vietnam vets. "Throughout his term,” writes Boulton, “Nixon attracted heavy criticism from the media, the veteran community and Capital Hill for cutting medical facilities.” In the end, what was finally offered Vietnam vets was, to many vets and Boulton too, unfair and unjust. Sadly, a majority of his colleagues did not agree. When, however, the destructive effects of Agent Orange and PTSD became common knowledge, psychological counseling and treatment for post-service trauma was deemed vital. Boulton gives much-deserved credit to psychiatrists Robert J. Lifton, Chaim Shatan and Floyd “Shad” Meshad for organizing and leading the effort to aid deeply distressed vets. Among their innovations were “rap” sessions where distressed vets shared their problems with other vets while a psychiatrist served as a moderator. No outsiders were permitted. Shatan then wrote an influential New York Times Op-Ed, “Post-Vietnam Syndrome,” where he acknowledged the “terror and disorientation” many vets experienced years after they left Vietnam – much as many Iraq and Afghanistan vets have felt. Time and again the Senate passed bills offering psychological services to vets and time and again the House turned them down. And what of Cold War vets and those who came after them? Should American forces sent to the Dominican Republic in 1965 to prevent leftists from assuming power not receive generous benefits too? And what about those who participated in our glorious military victories against mighty Grenada and Panama or served in Africa, Central America and the Middle East? The more enemies real and imagined, the more wars, large, small or even minuscule ones, the more vets will overwhelm the VA and its support and health care system. Should we ever return to the draft the numbers and costs will grow. Add that to the wages and benefits for the 300,000 people who now work for the VA and the $17 billion recently added to expand its health services. Men and women who serve in our inevitable future wars will learn, just as Vietnam vets learned, that those who send them to war will never be as bighearted as they were to WWII and Korean vets. Kudos to Mark Boulton.